Happy New year everyone, 2009 have been a year busy swapping OP-AMP. and to continue my training in the area of head-fi I will begin 2010 swapping Capacitors. I have all read the how different capacitors sound in different setup, but I will never really know unless I listen to them, The experience was really an ear opener when I tried it years also with all the Plastic, paper and different magical capacitors. I never believe in electrolytic (results from reading to much), and have always avoided them with DC servo to remove the DC offset. Swapping Capacitors could be tricky, Lead inductance will be an issue, At audio frequency a capacitors would act like an inductor, I would prefer to solder each cap direct onto the board, but heat will means that I have to run the cap for a while to let to reform, In the end I choose to socket my D10 for this purpose. The leads of the cap are kept to the minimum and temperature and condition of all caps are keep as constant as possible to reduce the forming effects of the electrolytic. The line up of capacitors are as follows. Not missing from the list with be the now extinct BlackGates NX Bi Polar. I cannot get the exact size of 10mm*12.5 But would be included in the listening test as a reference. I got 6.3V 220uF NX and a normal 220uf 16v. 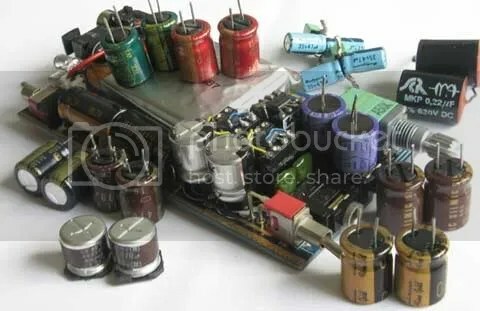 The list of capacitors would not be restricted to the above, will look for more (Time and wallet permitting). Currently the caps are going forming/burn in process on a rotation basis, I plan to have at least 100hours burn in for each cap. Capacitors rolling change the texture of the sound especially the timbre the harshness the body and sweetness of the vocal and instrument. OP-AMP however changes the whole spectrum, the noise level, the amount of distortion, the overall presentation and most importantly the resolution of the sound. The layering. For current D10 owner who have heard the D4, the differences in sound comes mainly from the Toshin UTSJ. By placing this Cap on the D10 it is very hard to differentiate the 2 different amplifiers. That is if they are using the same OP-AMPs. So if you like the sound of the D4 you could roll capacitor to make your D10 sound like it, more warm and texture. Sound impression after 48 hours burn in for each capacitor. My D10 Capacitor Rolling experience have been crazy! In the First week, All the different listening session left me in confusion. The sound of the Capacitor before burn in could be different within the same song. One moment it is good and another all bad. Once instance clear and bring another instance muddy and warm. At 24 hours brun in for the cap it is still changing but at 48 hours things seem to settle in a bit, but changes are still happening. ELNA Silmic — This is a very good all rounder, but the difference is very small compared to the newer 2, Simlic is warmer than silmic 2 but the overall air of confidence is missing compared to 2 and fro instrument silmic 2 is clearly better. ELNA Cerafine — I have the most trouble auditing this Change change change in the first 24 hours. Cerafine have great potential get resolution and warmth at the same time but some grain in the sound. It is getting less grainy as it is burn in at 48 hours it has not settle yet. so let see later. NichIcon KZ — Best for string instrument, the texture and air around guitar string never sounded so real on the D10 you could tell if the string are metal or nylon, Vocal is as good as the Silmic 2 and maybe a tat warmer. Nichicon FineGold — It is a good all rounder but not in the league of cerifine, Silmic or KZ. Neutral and extended. Nichicon ES Bipolar — The king of vocal, Super warm and super sweet. After 48 hours it less warm and less sweet, but still much more than the rest. Th best if you ONLY listen to acapalla and or vocal. It is so good that I forgot I am audition cap and just enjoyed the song. Instrument and bass however need to be improved. Toshin UTSJ — Warm sounding, as QUSP noted the high are not as clear as the best but for vocal it is sweet and warm. bass is deep and strong as well. Even with a WIMA bypass the high did not open up enough. Sanyo WG — Good for sub sonic monster otherwise not an audio capacitor. Sanyo OSCON SP — Thin on vocal, bright and clear at the high end. Extended bass. Sounds disappointing. Panasonic FC — It has an all rounded sound , but does not excel in any area. Vocal is there but a tat cold. High is there but not extended or sharp. Nippon chemicon ASF — Vocal is tat warm and high bright and clear, bass is there but not extended. Black gate 220uF 6.3V NX — Sound stage is small, Vocal is full body slightly warm. Instrument is distinct but not as hair raising as Silmic or the KZ. Vocal not as smooth as the Toshin. Lots of sibilance. Bass does not goes to the very low end, but when it hit it is hard and solid. But is is one very musical capacitor. Overall the presentation of the music is balance and very enjoyable. At 48 hours the sound start to get muddy. Black gate normal 16V 220uf — This one is added for comparison it does not meet the rule as it is 10mm*20mm. The black gates excel very well in the highs but similar to NX it has sibilance. The bass for this one is deep and powerful, but voice is a not sweet or mellow. Thanks for the round up, I’ve been looking for something this for a long time! The Capacitors you mention are not electrolytic, It would be too large to fit into a small amplifier. My comparison limited to a size of 12.5*10mm. And I do not think there will be any di-electric capacitor that would fit in.